Here it is! My pillow pattern. If you make a pillow using my pattern, I hope you will share the link in the comments! Enjoy! I love the cushion I made using Lucy's pattern from Attic24. It's colorful happiness makes me so happy. But the petals bother me. They fold forward and don't really sit right. I don't know why. 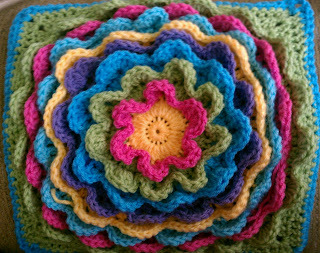 I suspect it may be due to an extra stitch between each of the petals. A friend of mine asked me to make a pillow for her and I started one with Lucy's pattern. 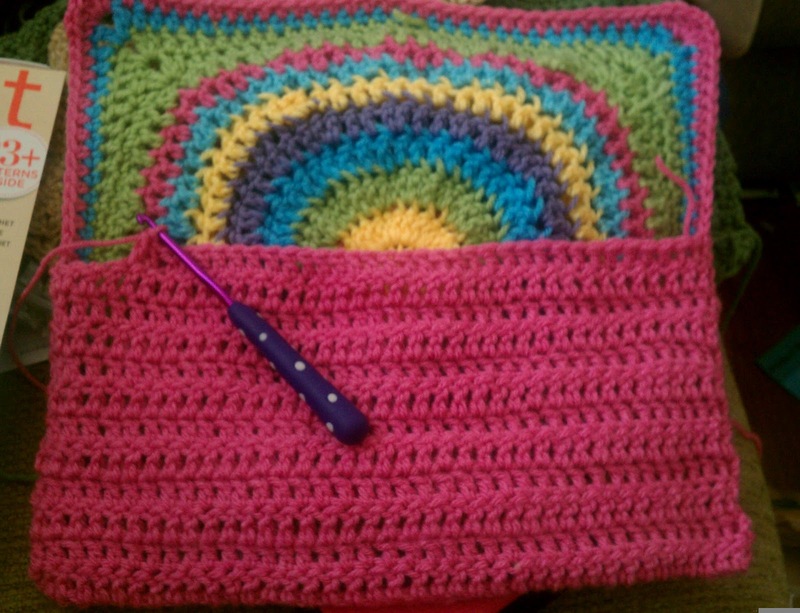 She wanted brilliant happy colors for her pillow and chose pink, turquoise, light green, purple, yellow, and aqua. You can see that the pattern starts great in the center, but as it spreads out toward the ends, the petals flatten out and start doing strange things. 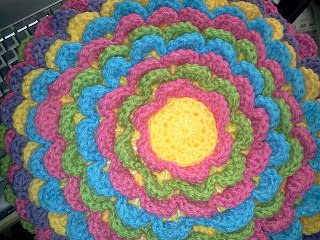 I ended up turning the circle into a square to create a square pillow. For the back, I used Cherry Heart's back of cushion tutorial to create a fabulous back. The back is literally crocheted to the front panel about 3/4 of the way and then the second part is crocheted from the other end. My friend asked for a lot of pink in the pillow, so I made the majority of the back the lovely bright pink color. By the way, did you notice my birthday present to myself? Isn't my new purple polka dot hook beautiful?? The color is a little off, but this is what the back looks like. 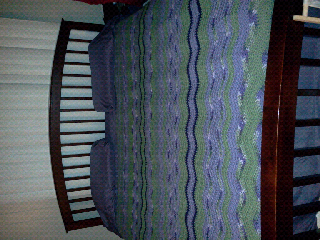 I just need to add the buttons and it is finished! 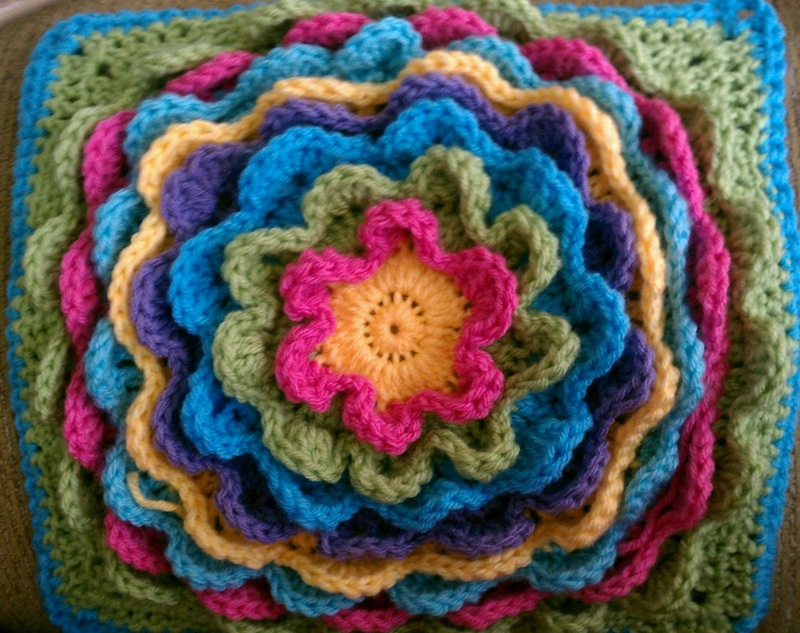 When I finished this pillow, I wondered if my original flower pillow pattern wouldn't work better. So, I used my remaining yarn and created this pillow. 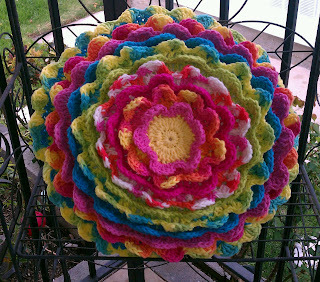 My version has a different way of increasing the circle and has one fewer stitch between petals. Here's a view from above. See how even the petals are? They stay nice and loopy and don't flatten out as you get to the outside. Now I just need to write up a pattern so that I never forget how I made this happy flower!